In Moscow, they are "non-Soviet Russians." In New Delhi, they are a "political Goliath" that may soon awaken. In Beijing and Sao Paolo, they are lawyers and other professionals who complain about glacial state bureaucracies and endemic graft. Prosperity is spreading in many emerging market nations, but political change is not. Economic liberalization has sparked vast economic changes in the BRIC nations of China, India, Russia and Brazil. A middle class that was once made up of government servants is now dominated by private-sector employees. At the same time, government institutions that once provided the basics of life — education, health care and employment — are crumbling. Frustrated members of the middle class are demanding change, but traditional power holders, from President Vladimir Putin to India's large political parties, remain entrenched. For middle-class Russians, economic power has not brought political power. "They want modernization," a Russian analyst who asked not to be named, said in a recent interview in Moscow. "They want to be respected by the outside world." The dynamic in each country is different, but Moscow's middle class is one example. Employed by private companies and financially self-sufficient, they are the winners of economic globalization. From software engineers to interior designers, they prefer international brands and traveling in Europe and are closely connected to global events and culture through the Internet. Disappointed with state-provided health care and education, they are launching their own organizations to fill the gap. Maria Lipman, a scholar in residence at the Carnegie Center Moscow, described this group as "achievers" who "believe in charity, just like their counterparts in Europe." "I like to describe them as non-Soviet Russians," she added. "They do not share the traditional Russian mentality of state paternalism." Last year, tens of thousands of members of Moscow's middle class took to the streets to protest Putin's disputed re-election. The protesters themselves were surprised by the size of the turnout, according to Lipman. "Suddenly, they woke up to politics," she said. But a crucial dynamic limited their effectiveness. 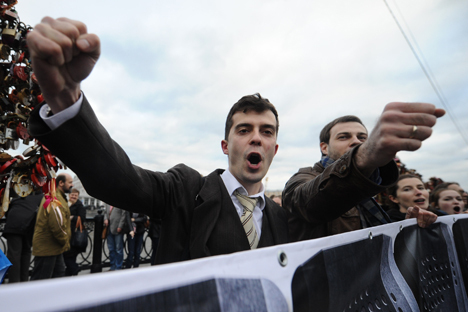 Moscow's middle-class protesters viewed engaging in traditional politics as debasing. Choosing leaders, compromising with other groups and slowly building an opposition movement were seen as corrupting. The movement's divisions and a crackdown by Putin diluted its strength. Whether Putin can retain power past the end of his term in 2016 is unclear, but many members of Moscow's middle class are increasingly focused on leaving Russia, not changing it. "The reason they are contemplating getting out is this utter lack of protection," said the analyst. "'I'm fine now, but if I've got some conflict with the authorities, I'll be thrown in jail. The judicial system is politicized and corrupt." India's growing middle class has also shown signs of a political awakening. Last year, hundreds of thousands of members of the country's burgeoning middle class ended a decade of apathy and protested corruption for the first time. So far, they appear to have largely failed to break the hold of the dominant political parties, which primarily serve India's ultra-rich and rural poor. Nationwide elections scheduled for 2014 will show if India's middle class can gain more political clout. In Brazil, explosive growth in the urban middle class has largely failed to break the hold of entrenched political parties that are widely regarded as corrupt. Middle-class Brazilians applaud the efforts of President Dilma Rousseff to reform the government but still question whether she can succeed. In an interview in Sao Paolo last fall, Denis Dias, a lawyer for an energy company and the first person in his family to go to college, said Brazilians pay tax rates that rival those of Western Europe but do not receive commensurate services. "People are getting really disappointed," he said, "because it doesn't achieve results." At an IKEA store in Beijing 18 months ago, members of China's middle class expressed frustration as well. In separate interviews, a banker, an accountant and an interior designer complained about spiraling housing prices, inequality and government corruption. They also criticized the government's blocking of Facebook, Twitter, You Tube and other websites. A 37-year-old software developer for Ali Baba, China's equivalent of Amazon, was the most negative. Despite being enormously successful in China, he said he was applying for a Canadian visa because pollution and poor schools were harming his 18-month-old son. "They teach children to tell lies," said the man, who asked not to be named. "They teach bad values." This middle-class activism may be spreading. Last week in Pakistan's national elections, anger at corruption and poor government services brought 40 million new voters to the polls and produced a record 60 percent turnout. Protest movements are electrifying, but the biggest threat to entrenched power holders remains an organized, disciplined and politically potent opposition. Russian and Chinese leaders have been ruthless in keeping one from taking shape. Indian and Brazilian politicians use more subtle means to maintain their hold on power. Until members of the new BRIC middle classes embrace the ugly, but necessary, world of politics, however, Putin and the other entrenched elites will have little to fear.